MEAT 'N GREET Animal bones and stone artifacts unearthed in North Africa, including this chunk of stone from which sharp-edged flakes were removed, indicate that hominids chowed down on meat there as early as 2.4 million years ago. Ancient stone-tool makers spread into largely unstudied parts of North Africa and the Arabian Peninsula surprisingly early, two new studies find. Discoveries in Algeria and Saudi Arabia underscore how toolmaking traditions enabled Stone Age Homo groups to travel long distances and adapt to different environments, researchers say. Hominids used simple cutting and chopping implements to remove meat from animal carcasses in North Africa around 2.4 million years ago, archaeologist Mohamed Sahnouni and colleagues report online November 29 in Science. That's roughly 200,000 years after the first known appearance of such tools in East Africa. Early members of the human genus, Homo, either continued to make these tools after moving from East Africa or independently created similar tools in East and North Africa, the scientists conclude. Earlier excavations at two other Algerian sites, also conducted by Sahnouni's team, had uncovered stone tools and evidence of animal butchery dating back no more than 1.8 million years. No hominid fossils have been found at any of the North African locations. But the discovery of stone tools strewn among butchered animal remains at Algeria's Ain Boucherit site adds to evidence that Homo evolution didn't just occur in East Africa (SN: 12/23/17, p. 24). "Our ancestors ventured into all corners of Africa," says Sahnouni, of the National Research Center for Human Evolution in Burgos, Spain. Discoveries at Ain Boucherit "show that the North African savanna corridor and the East African one were connected and early [Homo] started using stone tools and eating meat basically simultaneously in both areas," says archaeologist Manuel Dominguez-Rodrigo of Complutense University in Madrid who was not part of the research team. Sahnouni's group excavated stone tools and animal bones from two sediment layers at Ain Boucherit. After initial finds in 2006 and 2008, fieldwork from 2009 through 2016 produced a total of 17 stone artifacts from a lower, older sediment layer and 236 similar specimens from an upper sediment layer. Lower and upper layers also contained 296 and 277 fossil animal bones, respectively. Identification of previously dated reversals of Earth's magnetic field recorded in the soil and estimates of the time since sediment had been buried provided ages of around 2.4 million years for the lower layer and about 1.9 million years for the upper layer. Fossil bones found among stone artifacts at Ain Boucherit came from savanna-dwelling animals such as elephants, horses, rhinos, antelopes and crocodiles. Incisions typical of butchery appeared on 17 bones from the lower sediment layer and two bones from the upper layer. These marks were mainly made on limb bones, ribs and skulls, suggesting activities such as skinning and removing flesh. Another four bones from the lower layer and seven from the upper layer displayed hammering and smashing marks, probably as a result of marrow removal. Ain Boucherit hominids acquired prime parts of game either by hunting or by scavenging at fresh kill sites, Sahnouni suspects. "The Ain Boucherit evidence could be pointing at some kind of confrontational scavenging where [hominids] were stealing kills from carnivores before carcasses were fully defleshed," says archaeologist Ignacio de la Torre of University College London who did not participate in the study. That tactic appears most likely, he holds, since evidence of hunting in Africa around the time hominids wielded meat-cutting tools in Algeria is scant. Long after North Africans sliced up carcasses, a different form of toolmaking headed in another unexpected direction. 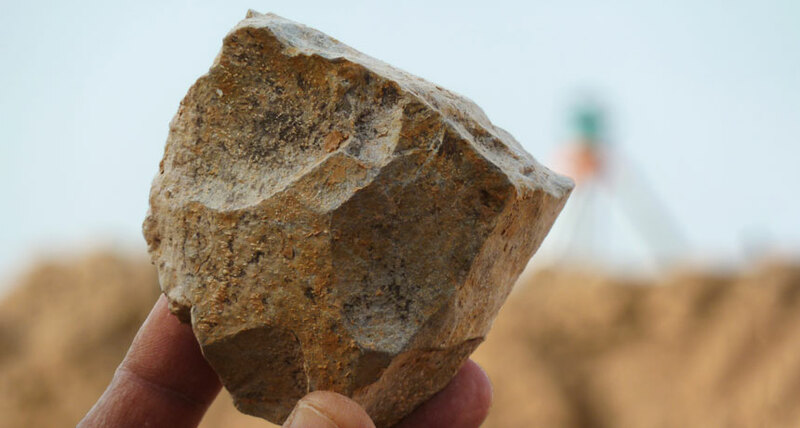 An African toolmaking style going back nearly 1.8 million years (SN: 10/8/11, p. 12), which included teardrop-shaped hand axes, appeared in the center of the Arabian Peninsula around 240,000 to 190,000 years ago, researchers report November 29 in Scientific Reports.